After fading from the enthusiast market over the past few years, VisionTek is back in a big way with the release of a watercooled R9 290 video card. Dubbed the CryoVenom, this GPU is the first and thus the fastest custom-built liquid cooled R9 290 on the market. 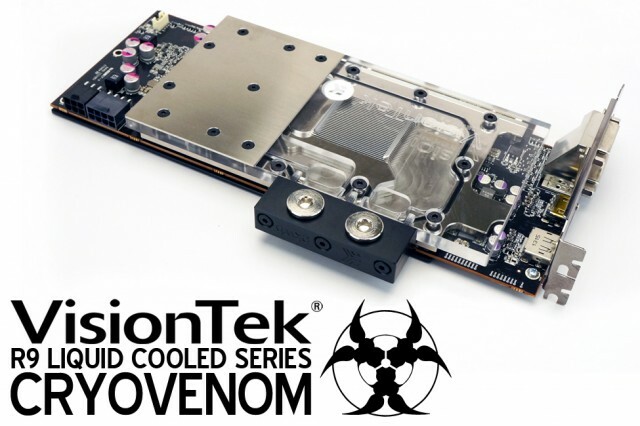 The waterblock and backplate were custom-designed by EKWB, exclusively for VisionTek. 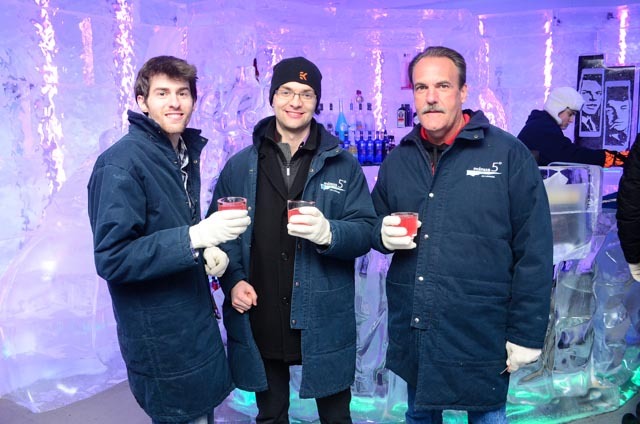 In celebrate the launch, VisionTek and EKWB held a party at the freezing Minus5 Ice Bar (pictured below) where I got a first hand look the CryoVenom in a test system. Although I did not get much time to play with the card, performance details are included in the press release below. We also hope to test one of these in the near future. January 8, 2014, Las Vegas, NV – VisionTek Products LLC, (VisionTek®) http://www.visiontekproducts.com, a leading manufacturer of award-winning, high-performance upgrades and accessories for PC and Apple Macintosh® computers, announced today its CryoVenom R9 290 as the industry’s first and fastest custom-built liquid cooled AMD Radeon™ R9 290 graphics card on the market and available for immediate shipping. The hand-built card delivers lower temperature, near silent operation, and higher performance compared toVisionTek’s stock R9 290 card; as well as better benchmark performance and a $150 lower price than the NVIDIA® GeForce® GTX™780 Ti. The Radeon R9 290 series of graphics cards are rated by many sources as the best graphics cards available today. However, VisionTekengineers discovered that when its R9 290 graphics card was 100% utilized in the testing lab under conditions such as extended game play – the card’s temperature could climb to 201°F. Even with very efficient fan cooling and the latest AMD Catalyst driver that provides a 100% fan speed operation, the card’s built-in thermal safety feature would downclock the GPU from the factory 947MHz speed to as low as 662MHz. Combined with this performance reduction of 30%, the increase in fan noise was measured at 71dB, a sound level considered louder than a normal conversation. Obtaining maximum performance from the CryoVenom R9 290 couldn’t be easier. Just enter the specifications from the included build sheet in the Catalyst™ Control Center and in less than a minute, the CryoVenom R9 290 can safely deliver up to 1175MHz GPU speed…a 24% increase from the stock setting of 947MHz. The memory clock speed is also increased up to 1450MHz… 16% faster than the 1250MHz stock setting. And unlike standard cards in which overclocking voids the warranty, the CryoVenom R9 290 comes backed by a one year warranty. The CryoVenom R9 290’s water block provides maximum cooling performance for the GPU, RAM, and Voltage Regulation Module (VRM) even when low power water pumps are utilized. The block’s electrolytic copper base is clad with a chrome appearance-like nickel plating to prevent corrosion while the precision cut acrylic top provides effective and quiet fluid flow. The CNC machined black anodized aluminum backplate protects the card’s sensitive circuit board components during installation handling while also providing additionalpassive cooling for the VRM. 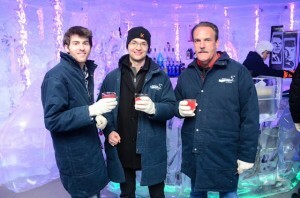 We’ll be sure to test these claims when we get the card in our labs. VisionTek also let us know that the test system used at the party will be given away to Facebook fans later this month, so stay tuned for details. if it ever came in stock at my local stores, boy would that be tempting!